Introduced from North America in the early 1900s these familiar white (or pale yellow) Shasta daisies come in a range of heights, as single or double flowers, and with simple or frilly petals. All can be relied on to flower from late June through to September -most will re-bloom happily if cut back after flowering.Leucanthemum x superbum ‘Aglaia’ is a lovely clump forming perennial. 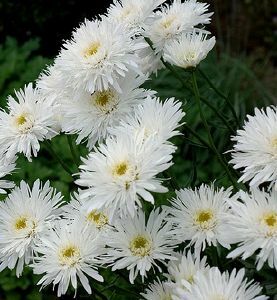 Very frilly white daisy-like flowers with yellow centres from early summer to autumn. An excellent cut flower. Plant in any reasonably fertile soil, well-drained in sun or part-shade. Approx. 60cm tall so ideal for front/middle of border.